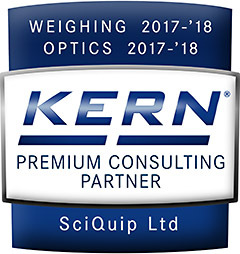 The KERN OBF model is an excellent, stable laboratory microscopes for all common routine applications. Through the simple Köhler lighting, the adjustable field diaphragm and a pre-centred and height-adjustable Abbe condenser with adjustable aperture diaphragm, these microscopes produce superb images in both the light and dark field. As standard, these microscopes, depending on the model, are fitted with wide-field eyepieces, achromatic, plan-achromatic or infinitely corrected E-Plan lenses. These binocular microscopes are fitted with a dioptre compensation. A trinocular head is available as an option so that you can connect a camera. A revolving unit for up to 4 lenses and a large specimen stage are included with delivery as standard. The following optional accessory items are available: Various eyepieces, lenses, a complete polarisation kit, a phase-contrast unit as well as complete HBO and LED fluorescence kits etc. The light is provided by a 20 Watt halogen lighting unit or by a 3 Watt LED version as an alternative. A central feature of this adaptable, robust microscope range is the stable mechanism which can be adjusted precisely.